On April 17, I was invited to do a presentation on Git for Purple Scout in Malmö, Sweden. Around 40 people showed up (including many XMMS2 folks) and endured 2-hours on what Git is, why it’s so awesome and all the fancy stuff you can do with it. I think people liked it and although most seemed to be using Git already, they were nice enough to say that they’d learned something anyway. 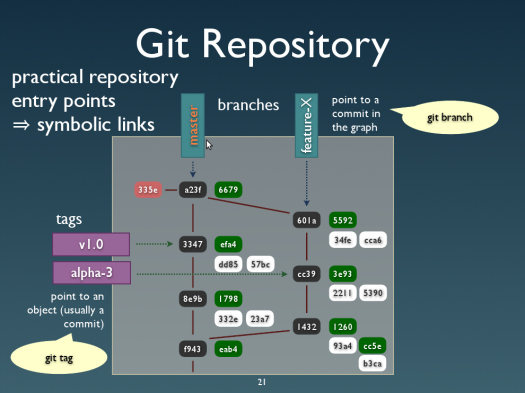 I’d given talks about Git previously in Switzerland, but for this occasion I reworked and pimped up my slides quite a bit to cover more material and have more cute diagrams. As before, you can get the slides for the Git presentation (PDF), or even fiddle with the source file, under the terms of the Creative Commons Attribution-Share Alike 2.5 License. Reuse, modify or poke fun at at will! Sorry it’s still in proprietary Keynote format, because that’s the only vaguely acceptable software I found to make lots of diagram easily… Any Free alternative would be welcome, if someone knows of one. It was great fun preparing and giving this course, and being back in Sweden and seeing friends again, so tusen tack till Purple Scout for making this happen!